Can you believe we are in the second week of September already? Fall is here for sure. So I wanted to create a fun fall card. I used all digital elements and papers from Lori Whitlock. I just printed the papers in the size I wanted to make my card. 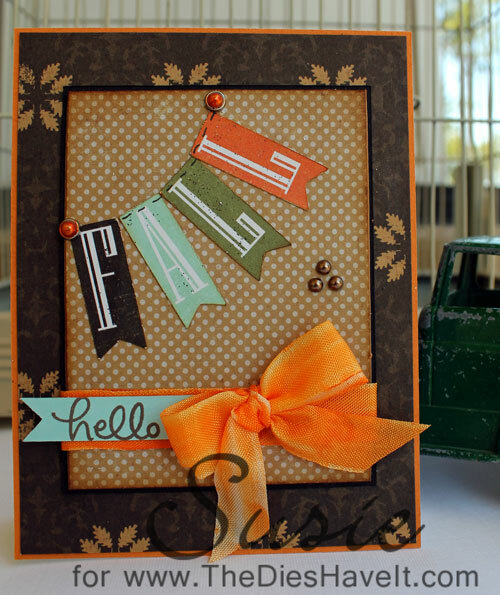 Then I printed and cut the fall banner using my Silhouette Cameo. I am not really sure I can make things anymore without my Cameo. It is probably the best purchase I've made in a while! I used Eyelet Outlet pearl brads as "hangers" for my banner. Then I drew lines at the top of each piece to look like thread. My final touches were adding the sentiment and the seam binding bow (which I colored with Copic Markers) Then I dabbed just a bit of platinum Stickles on the banner and added a few pearls. DONE! I hope you enjoyed today's card. I'll be right back here tomorrow with another card for you- this one using a Bugaboo Digi Stamps new release. This is so fun! Love the fall colours and that bright bow! I've heard that those Cameos are super great! Glad you like yours!